Earlybird Bait | Earlybird Bait is a wholesale supplier of quality fishing bait for recreational and professional fisherman in Western Australia. Fish always wait for Earlybird Bait! Welcome to Earlybird Bait a wholesale supplier of quality fishing bait for recreational and professional fisherman in Western Australia. 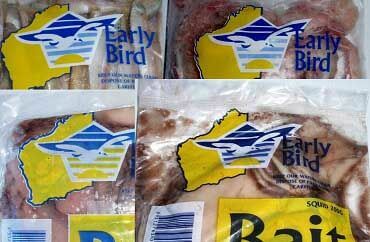 Over the last thirty years Earlybird has established a network of local fishermen who supply first grade bait products. To extend our range of quality bait products, Earlybird has ventured over seas and established a relationship with importers and processors. 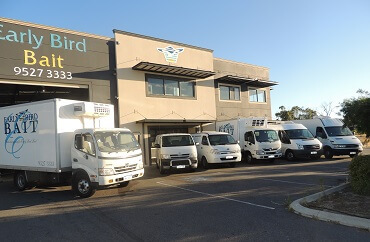 Earlybird Bait realises the importance of their refrigerated delivery vans, because of this, we offer free delivery to outlets within the Perth metropolitan area. We can also arrange delivery to all centres with freezer transport. 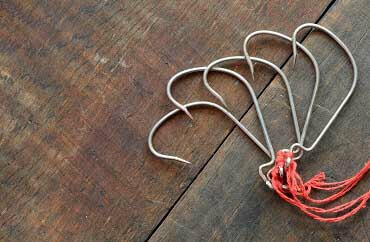 With over 300 bait outlets throughout WA, there is a distributor near you. Being a leader in the industry has given us the chance to discover methods and processes that ensure our customers are delivered quality products. Like our packing machine which is capable of packaging a wide range of bait products from 15g up to 2500g with packaging speeds from 40 -100 packs per minute. Earlybird Bait has come a long way from their humble beginnings of the residential garage. Both of the owners Sue and Garry Dawe have had a long association with the industry and with their combined skills and knowledge they have emerged as one of the industry leaders. As the company began to expand Garry and Sue Dawe moved to Hamilton Hill so they could be close to the action of the fishing industry and the fishermen. Garry’s Great Grandfather was the first person in WA to can Herring and Mullet in the late 1890’s and export them to Europe. Both his Grandfather and Uncle’s took over the business in the late 1930’s and supplied the Australian Army with seafood during World War II. Garry’s Father fished the Mandurah Estuary for many years before he went to Exmouth to spend the next 25 years bait fishing. Garry entered the Crayfishing industry in the early 1980’s and spent about 18 years as a Crayfisherman before he and wife Sue bought Earlybird Bait in 2000. Sue’s family also pioneered, fished and farmed in the Coolup District. With the success of Earlybird Bait, Garry and Sue are generously involved in sponsoring local clubs and sporting associations.